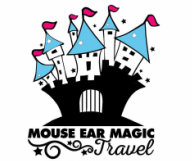 Mouse Ear Magic Travel™ is an agency that specializes in Disney destination vacations. As a tribute to our knowledge, passion and dedication to the Disney product, Mouse Ear Magic Travel ® has earned the designation of being an Authorized Disney Vacation Planner and has received the Earmarked award for our agency given to us by Disney Destinations. This prestigious award is not only an honor but a milestone for Mouse Ear Magic Travel® showing the dedication, passion, hard work and loyalty that our team of Travel Professionals provide for our client families. The trust and loyalty that our clients have for Mouse Ear Magic shines through with this achievement and we couldn't be more grateful for this honor bestowed upon us. Mouse Ear Magic Travel™ is put together with a team of Travel Professionals, all Disney College of Knowledge graduates whose training and knowledge of the Disney destination product is superior and second to none. Our expert and first hand experience allows us to be the best of the best at what we do. You will not find another agency with so much passion, heart and dedication for Disney as a whole. Our entire team takes pride in knowing that with every family that we help plan a vacation for, we have shared a bit of the magic that can be truly life changing.